Utilizing the City of Moorhead’s planter adoption program, eleven artists were hand selected to create the unique pieces of art which now decorate the planters across from the Rourke Gallery in Moorhead, Minnesota. A showcasing of Moorhead’s talent and developing downtown, Sticksgarden is a lovely community space. And, a celebration of Moorhead. Sticksgarden was made possible by the voters of Minnesota through a grant from the Lake Region Arts Council, thanks to legislative appropriation from the Arts and Cultural Heritage Fund. Rarely does reality turn out better than a dream. Yet, this is just the case with Sticksgarden. Below is a rendering of the concept design for the main planter. Let this be a lesson to us all to never underestimate the creativity and talent of our local creative class- or their passion for making Moorhead even more fantastic. 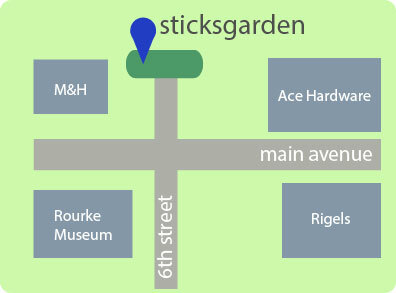 Sticksgarden is located between M&H and Ace Hardware on Main Ave at 6th Street.